Originally I had this in the learning page but it deserves a page all it's own. 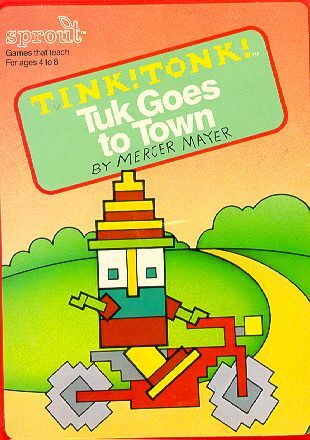 Especially since it is the #1 Tink Tonk page on google. The first time I saw Tink Tonk was a two page ad in the September 1984 issue of Antic magazine. Since I still have it why don't I show you. Click the picture for a larger image. Let me type the ad text for you. Modern times have created a new breed of teachers. We've cleverly disguised them as funny creatures from a computer game. But underneath the funny exterior is one of the most serious approaches to home education you've ever heard of. INTRODUCING SPROUT™ SOFTWARE. GAMES THAT TEACH. Your kid's new teachers are called Tink and Tonk. They come from Sprout. Software for kids from 4 to 8. The beauty of Sprout software is how entertainment is balanced with a healthy dose of education. While kids are having fun at home, they're actually reinforcing what they've learned in school. 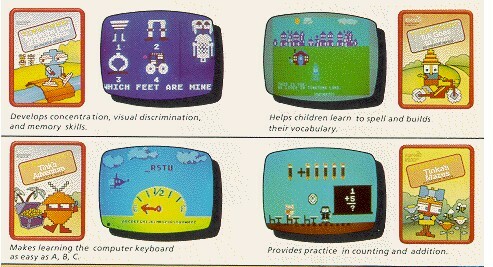 Things like the alphabet, spelling, vocabulary, counting, adding, and pattern recognition. You'll also like how Sprout prevents boredom. Our games grow up instead of wear out. As kids get older, the game adjusts and gets harder. Because there are many variations and many decisions to make. Knowing how to do all this isn't something Sprout learned overnight. You see, we've got a hundred years of experience to learn on. (Our parent company is SFN, the country's #1 textbook publisher for elementary and high schools.) We've also got the experience of Mercer Mayer, who has written or illustrated 80 children's books. He dazzles kids with ideas and pictures that keep them coming back for more. With TINK!TONK!™ software, kids see that learning can be more fun than destroying space creatures. sprout Games that grow up. Instead of wear out. 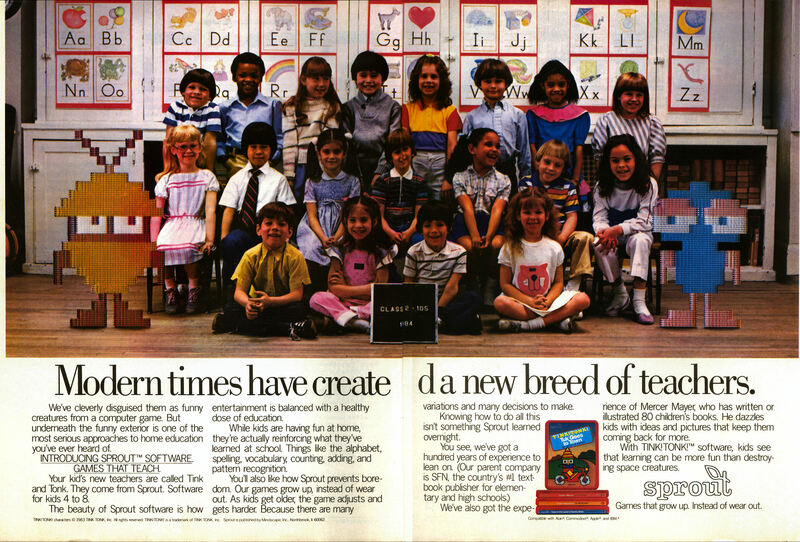 I wonder whose school class they used to take this Tink Tonk ad? The sign says class 2-105 1984 so it could have been a 1983-1984 class picture. Those kids should be about 30ish now in 2006. This was a series called Tink Tonk with likeable little characters and great music and lots of fun. 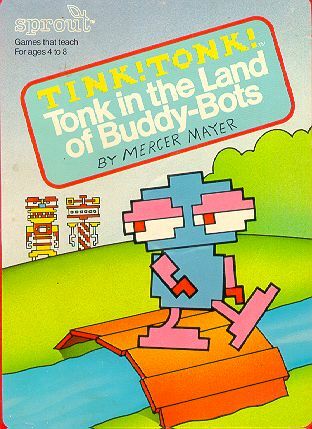 My favorite was Tonk in the land of the buddy bots. 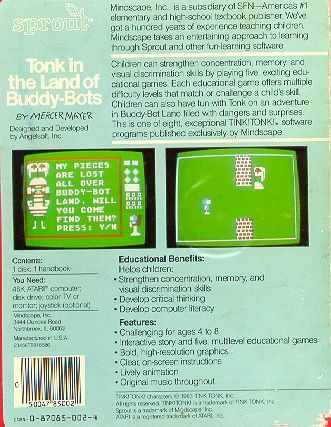 You walked Tonk around buddy bot land in search of missing buddy bot pieces. Several sub games let you build buddy bots or play a concentration like game. Falling in a hole or getting touched by a soldier sent you to the castle. Riding the raft or the sky ride was always a thrill. 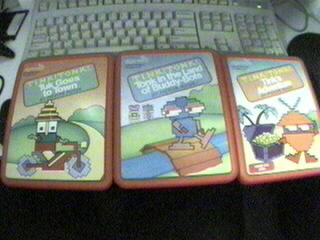 I have 3 of the 4 original buddy bot games. I applaud the genius that decided to put these in hard shell cases. probably why they are still in excellent condition. Now if I could just find the one I'm missing. 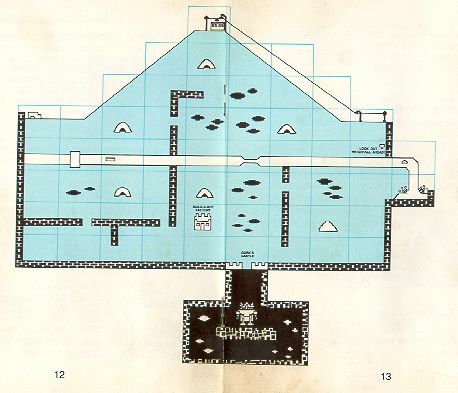 Tinka's Mazes :) Anyone? Anyone? Update: August 2003, bought Tinka's Mazes on eBay. Unfortunately it's the C64 version but at least I have it now :) I would love to get my hands on a Tinka's Mazes for the Atari. If you know of one for sale please email webmaster @ vulcanjedi . com. Update: March 2006 I finally got an Atari Tinka's Mazes. And I had to pull out my Atari setup to test it all out. Wow, this one is both sides of a disk. Buddy Bots is still my favorite. This game however simple is still something kids love. Since I finally figured out how to encode MP3's I have some sound clips from the Buddy Bot game. Hmm. I just tried to download them and tripod doesn't like the MP3 format... I'll figure this out later. Duh, it's not on tripod anymore. Enjoy! 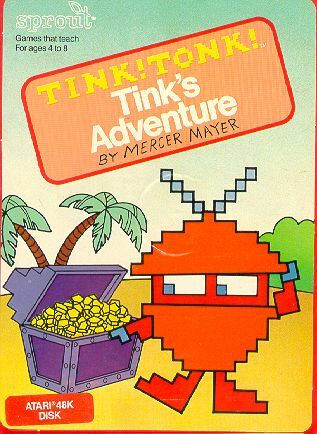 Tink Tonk visitors also know that Mercer Mayer has a website called Little Critter and you can send him email there.